There’s no better time to join in the fight against hunger. Ambit Cares makes giving your time as easy as a do-it-yourself program that allows you to tailor volunteering to your lifestyle. Ambit Cares, a 501(c)(3) nonprofit, aims to end hunger in America in the communities where our Customers, Consultants and employees live and work. Here are a few answers to the most common questions about Ambit Cares. Keep in mind that you can always take a look at the Ambit Cares website or contact us directly at ambitcares@ambitenergy.com with any questions. Who can volunteer with Ambit Cares? Anyone can volunteer with Ambit Cares – Customers, Consultants, friends of Ambit or employees. The more people we have fighting hunger, the greater our impact in the fight against hunger. How do I volunteer with Ambit Cares? Volunteering is easy. You can join a group activity or design your own volunteer event. A good place to start is the Feeding America website, where you can find a link to your nearest food bank or pantry. What type of volunteer events should I choose? Any event that involves ending hunger qualifies as an Ambit Cares volunteer event. A few examples are: feeding people at a soup kitchen; helping distribute food at an event; or packaging food at a food pantry. You can do this as an individual or with a group. When is the best time to volunteer? Anytime is a good time to volunteer! 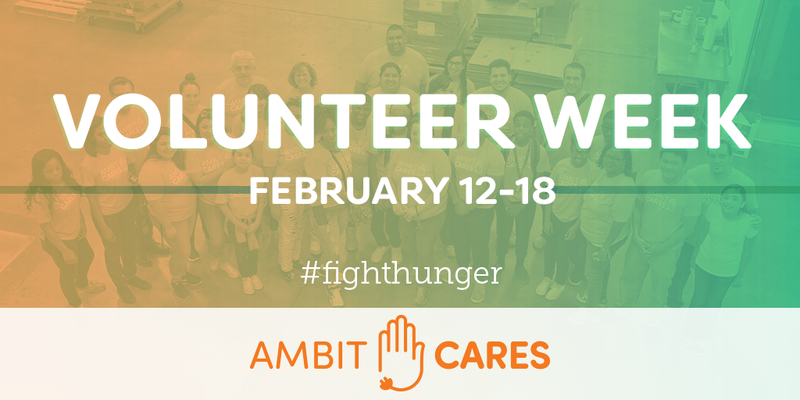 Ambit Cares also hosts volunteer weeks throughout the year where Customers, Consultants, friends of Ambit and employees all volunteer during the same week with various events around the country. The 2018 volunteer days are February 12-18, May 14-20 and October 8-14. How do I let Ambit Cares know that I volunteered? For our Consultants and employees, we like to know when you’re volunteering in the community. Report back your hours to the Ambit Cares website. You can also send us your pictures and post on social media using the hashtag #AmbitCares. These are just a sample of the things you can do to help fight hunger alongside Ambit Cares. While there’s a lot that’s already been accomplished, there’s still more to do. And, we need all hands to make hunger a thing of the past. Ambit Cares: Year in Review – Thanks for a Great 2017!